Sleek, beautiful brushed metal frame that may be engraved above and below the photo or verse you frame. Engraving is subtle and elegant on this frame. Glass and photo slide out and in the front. Black flocked backing with easel. In addition, this frame can be hung on the wall. 2 Sizes will hold a 5x7 inch photo. Photo or picture slides in easily from the side. Black flocked easel-back. 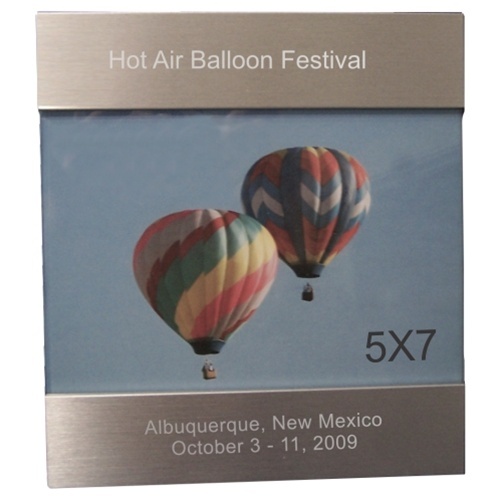 We offer three engraved lines for top and/or three engraved lines for the bottom. Overall size 7 1/8 in x 7 7/8 in. The frames are beautiful and the font was perfect. Will definitely buy from here, again.